Well-known for her wonderful years at Cadbury’s and loved by all her friends and family, Robin’s Auntie Marjorie was a big supporter of his charity walks and in particular Macmillan Nurses. Supporting the charity since husband Eric died in 2000, she has also left a legacy to Macmillans (£10,000) following her own death in January aged 91. Robin remarks,’ She often used to speak to me about the wonderful days as a youngster at Cadbury’s where she worked all her life – barring the war years.’ In her own words she describes the wonderful experiences she had in a bygone age of simplicity and fun. Starting work at Bournville in 1937 aged 14, I met Phyllis Palser and have been life time friends ever since, although she now lives in Western Australia. My first job was sorting nuts and raisins and by the end of my work years I had moved to quality control. As a teenager we used to cycle to Ullenhall to stay in a cottage owned by the Cadbury’s family. We looked after ourselves and I remember cycling to Henley where we enjoyed one of its famous Diary Ice Creams! During the war part of the factory was closed due to the difficulty in obtaining the ingredients. Phyllis and I went to do war work at Birmetals in Woodgate. I wanted to go into the ATS because I was a sportswoman, but there were no vacancies then. At Birmetals we made pipe work for our war effort and for us it was only a bike ride from home. My job was operating the overhead crane though I needed to be athletic to climb down by rope when there was an air raid – which was a frequent occurrence! We missed the sport at Cadbury’s but formed a cricket team so as to keep our interest alive. Towards the end of the war I met my husband Eric who was from Llangollen in North Wales. In 1944 we were able to return to Cadbury’s where our pensions had been kept on for us and we were able to resume our sporting activities. The facilities were great and we loved the sport; we played netball, cricket and hockey; often against other firms and after we enjoyed a lovely tea. I also learnt to swim at Cadbury’s – taught by Miss David and swam once a week for several years. The family were lovely people and were interested in everything we did. I remember Miss Dorothy riding her bike down Bournville Lane – she was just one of use really. When I got married I was given a carnation and bible by Mr Laurence and after 25 years service I received a gold watch by Mr Adrian – it still works too! I always loved buying the waste bags of chocolates from the factory shops. By the time I retired, after 43 years, I had worked all round the factory – starting in cocoa and finishing in the laboratory doing quality control! The last time I spoke to Phyllis on the phone, we both agreed those were the best years – especially playing cricket at Bournville! THE CADBURY’S ANGELS – Celebrating the life and times of Marjorie Jones. With the Cadbury’s Angels and their fun-loving ways. Written by Robin Moore as a Tribute to Marjorie’s wonderful life at Cadbury’s where she viewed her friends as an extended family. She will be sadly missed by all she knew – Marjorie we will always remember you. God Bless you. 25,000 miles completed by challenge walker Robin Moore who has also raised thousands of pounds for charity in the last 20 years. 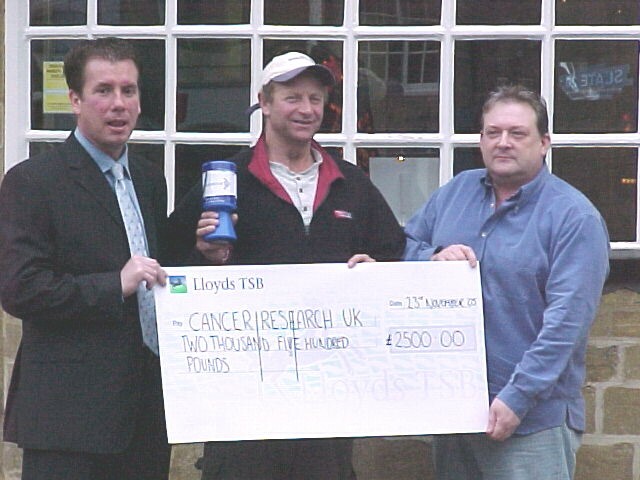 On April 20th 2012, Robin Moore completed a walk of 400 miles from Cornwall to Oundle in honour of Cancer Research UK. 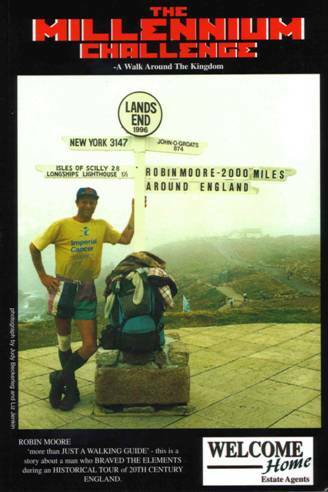 Barely a month after having surgery for a hernia repair, Robin set off from Land’s End on a 3-day walk to Bodmin to test his fitness; from there he continued with camping equipment beyond the border and on to the Nene Valley taking a fortnight in all to complete. Cold, wet weather added to an already difficult task, though Robin was encouraged by the wonderful people he met along the way. The event mirrored his first ever achievement for the charity (then Imperial Cancer Research Fund) which he completed in May 1992 when locals at the Ship Inn raised nearly £600 for his effort. Although the walk was deemed a ‘one off’, it turned out to be the first of many! 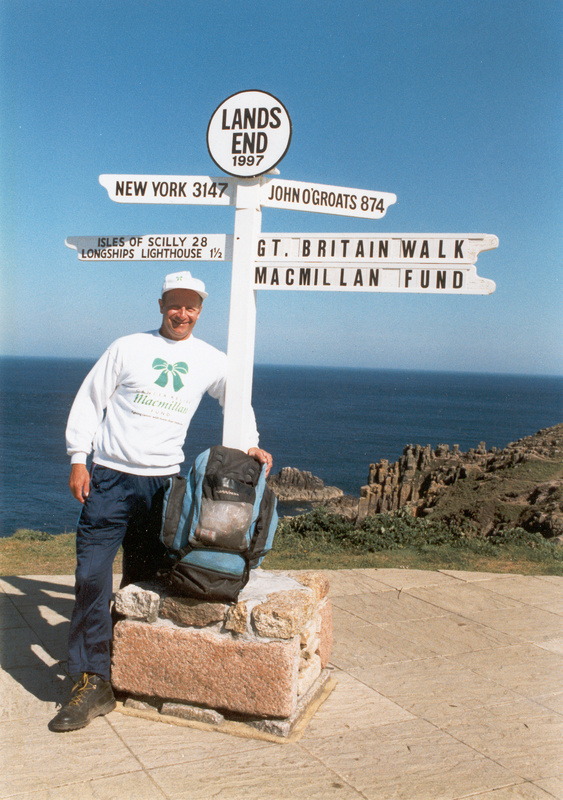 Throughout the decade Robin completed several walks, usually during his summer break from college/work, culminating with an epic 4,000 mile trek around Great Britain for the Macmillan Nurses which raised over £20,000 for the cause. Since then, the expedition walker/travel writer has completed 25,000 miles (pilgrimages/ charity walks) and has raised/contributed about £100,000 to Cancer Charities during that time. As a challenge walker who enjoys testing himself on demanding journeys, usually with limited support, Robin has an added interest in writing books/diaries and is in the process of developing a new website about his adventures. This work has been inspirational to many people who have in turn stepped forward to meet their own challenges; the books also go a stage further in helping to promote many of these worthy causes. Over half the walks have been completed for charity, and significant amounts have been raised for cancer research / local hospices who Robin continues to support. Robin has also been a major fundraising catalyst abroad; working as a volunteer for organisations in the Commonwealth, he has helped develop fundraising projects/ideas. In the last decade, he has walked whole countries raising the profile of charities with media coverage and distribution of leaflets/donation envelopes which he delivers each day to help create awareness. More recently, in the last few years he has dedicated time to developing Pilgrimages back in the Nene Valley (Oundle) and his family’s home in Cornwall. The projects have been set up in honour of regional hospices who Robin works closely with. The walks so far have raised several thousand pounds plus additional funds from spin-off events. With growing support from the communities, these events look destined to become major fundraising activities in the future. ‘In the last 20 years as an endurance walker, my only regret is not raising more money for charity. The great effort I put in to walking these distances never seems to be rewarded accordingly by the public who take for granted that I will always succeed!! Having grown up in the small communities of Oundle and Carharrack in Cornwall, it has proved difficult to obtain substantial support for one fundraising walk per year. In addition, I have to fund my own expenses through work, family, friends and corporate help so that I am in no way a burden to the charities I represent, (I have donated £40,000 to the cause to date). The greatest donation is time; the charity walks are the end product. The time spent at home on a computer promoting charities/organising averages over 20 hours per week. Aside from the financial logistics of each walk, comes the day-to-day management of the workload which is a barrier in itself. Each day on the road requires media interviews, which are necessary to give the charities good exposure: this sometimes incurs 16 hours of effort. Over the years, my local support has still been great despite the repetition of it all, but as a one-man army operating beyond the realm, my limitations are exposed. It is illegal to ask the public for money and so I have to rely on leaflet/donation forms distribution, sponsor forms and more recently an online ‘Just Giving’ page; funds handed into charity shops, or sent to a regional office without my reference will not be credited to me. Robin has completed 12 walks in excess of a thousand miles – eight of which were done in honour of Cancer Charities. Longest walk – 4,000 miles around Great Britain completed in 125 days. 4 Walks over 2,000 miles. A Walk around the Kingdom (England). The Barmy Army Walk (Cricket Road Show Tour of the Country). A Walk across the Continent (Ireland/Mediterranean). 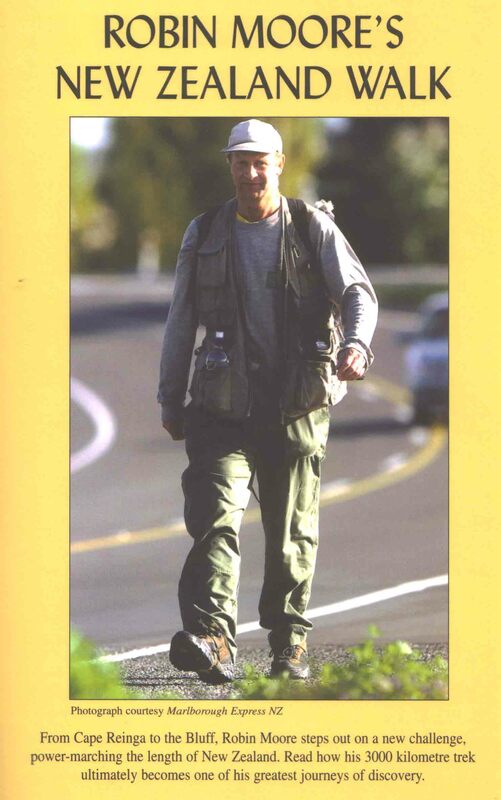 In the first decade Robin walked 11,500 miles. 8 walks for charity (Cancer Research and Care). Robin has written/Published 4 books. 10 walks in honour of Cancer Research and Hospice Care. 1 Walk for Mbekweni Township in South Africa. In this last decade he has written/published 14 books. Working with Merwe Genis, the Barmy Army and the Cape Cricket Academy, Robin’s goal is to help raise funds for youth cricket in the Western Cape. ‘As a founding member of the Barmy Army I hope we can hold charity cricket games at the Provincial ground (Boland Park) on future tours to raise funds for the township (Funds can be raised from match fees/entrance to the ground). Our coaches from Oundle Cricket Club have been instrumental in helping Merwe realise his goal and our concerns now lie with maintenance and support from public donations to ensure youth cricket has a future in South Africa. I hope to be walking to raise awareness before the next England tour takes place when we will set up a Trust for cricket equipment.’ A section dedicated to Mbekweni will be posted on the new website later this year- this will include News Archives -2010. Working as a volunteer for the New Zealand Cancer Society gave me a great opportunity to spend the summer season as a National Fundraising Campaigner walking the length of the country to promote the charity and help them raise millions of dollars. 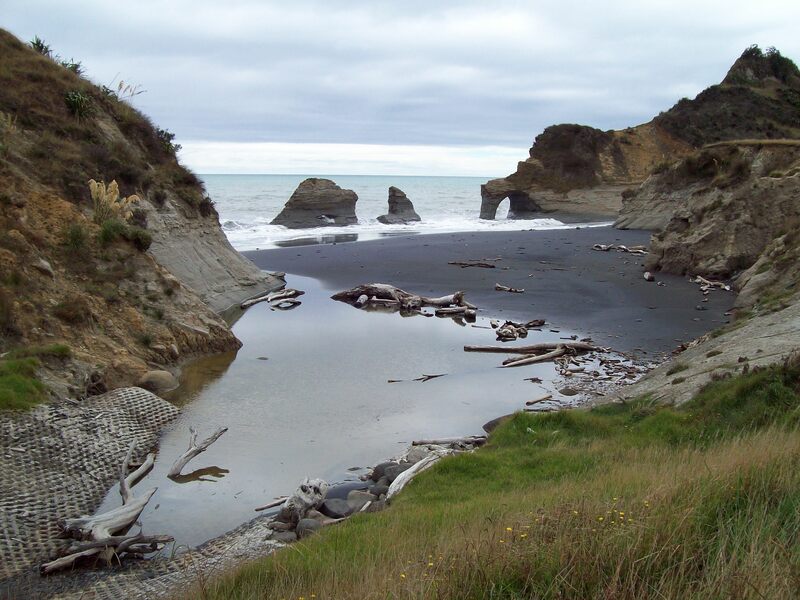 For my winter season walk I returned to New Zealand in January 2013 to walk the West Coast of the South Island in honour of the Cancer Society. As well as promoting ‘Relay For Life’ which is the country’s biggest fundraising event, we were able to raise money in Otago thanks to alot of hard work and help from Pete Donaldson who works for the Otago Times in Dunedin. For more details click on Spring Newsletter 2013. Barmy Army – as a passionate cricketer, Robin has occasionally combined cricket and walking, representing the Barmy Army on a couple of occasions when he was able to raise valuable awareness and several thousand pounds for hospice care and research. His work with the Barmy Army also includes the fundraising initiative he has helped to set up for Mbekweni Township in Paarl, South Africa. New Zealand -South Island Walk – the Cancer Society of New Zealand. Australia – Sydney to Adelaide via the Great Ocean Road – ‘Movember Challenge’. USA – Mexico to Canada – Cancer Research. South Africa – Namibia to the Wine lands – Mbekweni Township. Pilgrimages serve as excellent training/character-building walks that embolden the spirit and mind. Having completed Southern Europe (France, Spain, Catalonia and Portugal), Robin will continue to challenge himself on the Continent, walking Northern France, (the war graves), Belgium, Holland, Denmark and other countries in the EEC. Discover more when Robin launches his new website where you can also download titles from EBOOKS on the opening page. Website available soon – see updates on Face Book. DAIRY OF ANNIVERSARY WALK OF 2012 (Celebrating 20 years of ‘Challenge Walking’. 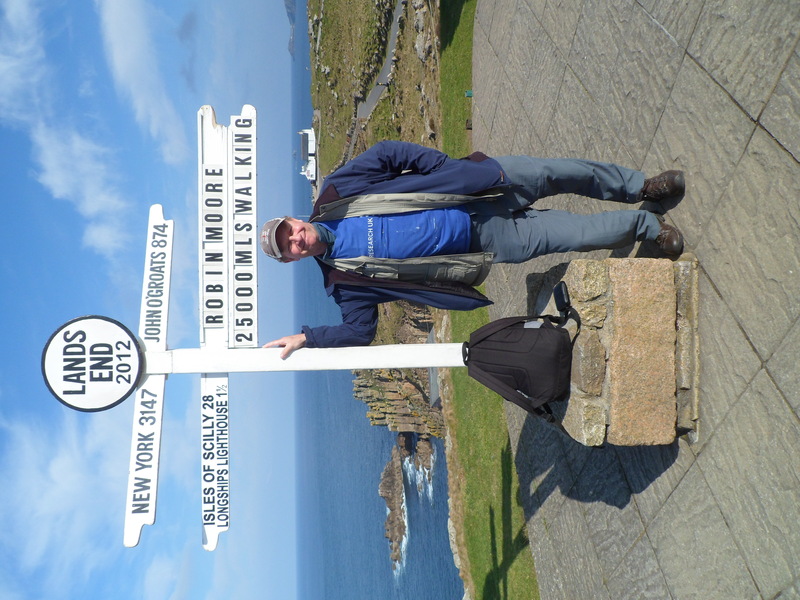 Sunny start, leaving the famous sign post around midday as all seemed quiet at Land’s End. The A30 was less accommodating with traffic looming at every corner though I was able to tick off the small communities safely enough as I made my way to Penzance. The centre of town was a busier episode with Market Jew Street rammed with tourists making the most of the holiday period. Beyond the town I walked the Gulval Road through Nancledra and Halsetown which was probably the shortest route to St Ives. On arrival at the Backpackers in St Ives I realised the Easter tourists were already in occupation as the narrow lanes became barely accessible. In the evening the pubs were lively too, though I was able to relax and enjoy a couple of pints before retiring. It was a wet and windy start as I made my way along the coast path through Carbis Bay and Lelant. Leaving the cliffs at Lelant Golf Course, I passed St Uny Church and a followed a lane into Hayle where I had a coffee at my friend Bunny’s Café. She took a sponsor form off me and from there I used the Cornish Way to Camborne which took in Gwinear, Carnhell Green and Penponds. At Camborne I grabbed a pasty and continued by road through Tuckingmill, Pool and eventually Redruth. From here I used the Gwennap Pilgrimage to reach Carharrack. Today was awful with heavy rain interspersing the sunny spells. Commencing along the Portreath Tramroad I had a reasonable passage to King Harry Ferry and once across the water I walked part of Route 3 as far as Caerhays. Then taking a country lane I walked to Palmassick and St Ewe where I photographed the lovely church and inn. The next stage continued along a busy road to the Heligan Gardens where I located a cycle track which led to Pentewen Holiday camp. From here I followed the river into St Austell. On leaving town I had a brief encounter with the Eden Project as the trail continued into Luxulyan Valley. The woodlands sheltered me from the heavy rain though eventually gave way to the country lanes which I followed to Lanlivery. Climbing the hills towards Bodmin I struggled against headwind and hale which later turned to torrential rain. It was quite dark as I embarked on the final miles for Bodmin and the road section was hazardous as water swept towards Lanhydrock. At the National Trust Building I turned right and followed the cycle route to Bodmin Parkway to conclude a rather abysmal day on the road. Resuming the journey I made my way to the top of Bodmin Moor and followed the Copper Trail through St Neot and the neighbouring villages as far as Tregadillet. The countryside was interspersed with old copper mines which were generally appealing to the many explorers I saw throughout the day. On reaching Tregadillet I camped at Brenda’s site and visited the Eliot Arms where I enjoyed supper and a couple of pints. This was the first inn I had stayed at when beginning my campaign as a charity walker way back in 1992 – thankfully it had changed little. Leaving around nine I walked into town and had coffee with Nick Crawshaw an old pal from School days and ex-native of Oundle. We had a good chat and after parting I set off along the old A30 to Lifton. It was an arduous day though thankfully there were opportunities to stop. The full journey was only 24 miles and yet I did not reach the Hostel at Okehampton until around 7pm. Once I was settled I managed to get fish & Chips for supper which was later washed down with a bottle of wine to end the day. It was a lovely hostel set beside the railway station which was an added attraction and no doubt popular in summer months when it runs services between Meldon and Exeter. From here I walked into town and located my route for the day along the B3215 on the edge of Dartmoor. 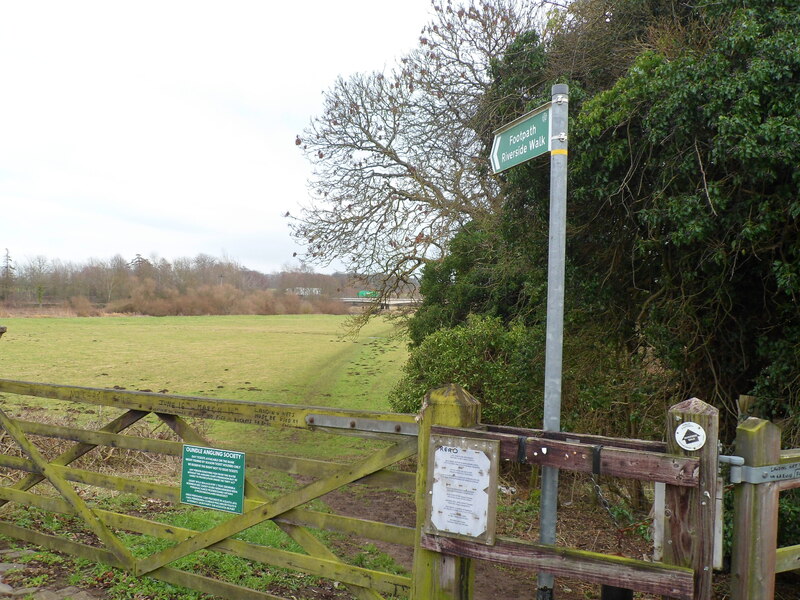 Initially I enjoyed a good start along the Crediton Road passing the old railway line on a couple of occasions. No trains today but there were some decent views all around and at Bow I was able to use a quieter country lane via Coleford which gave respite from speeding traffic. Stopping at Crediton I managed a snack before heading off on the Tiverton Road which required a couple of hours intense concentration. Teatime traffic sped past at alarming speed yet thankfully I made my ground before nightfall and was fortunate enough to locate a guest house on Bridge Street which happened to be next to a Wetherspoons inn. Great – steak for supper! Using the Great Western Canal I enjoyed the morning session, though there were occasions when I got lost trying to pick up old sections of the route. As the afternoon drifted on I used the back roads to reach Wellington by which time my feet were very sore. It was a struggle walking to Taunton and on finding a Travel Inn I felt as though I didn’t want to press on any further. There were no vacancies here but they let me camp in the grounds so I was able to get warm and enjoy a meal in the restaurant. Leaving in the shadow of rain, I made my way out of the city and onto the A38/A361 to Glastonbury. The weekend traffic was intense and there were only a few villages to break up the monotony of the road. I stopped at the Cancer Research shop at Glastonbury for a photo which would commemorate 20 years of service to the charity campaign. Beyond here it was a laboured affair which saw me limp to the outskirts of Wells where I was allowed to camp in the pub yard at the Pound Inn and at least enjoyed good company, food and ale to wrap up the day. It was desolate in Wells – every one must have been at church with the exception of those admiring the cathedral. It was wonderful to see the cathedral which probably ensures Wells remains the smallest city in England. Moving on I followed the old Bristol road almost to Bath stopping 5 miles short so as to stay at the Wheatsheaf owned by Ash who has become a good friend of Chris Mee and Jo who I know from Oundle. We all arranged to meet up and after a steak we enjoyed a few ciders. After Chris and Jo left, I kept the fire stoked up and bedded down for the night. Ash went home and left me to mind the inn; he has been busy renovating the place and has suffered some long days getting the place up to scratch. After a full English breakfast with Ash and the chef, I bade farewell and was on my way to Bath (which was appropriately wet) – first joining the A4 and then following the canal towpath into the city centre. It seemed a long trek to the outskirts where I followed the A4 into Wiltshire; first passing Box Tunnel and later Chippingham which I reached around 4.30pm. The next stage along the Lyneham Road was a hazardous, wet episode and I was glad to divert to a country lane which led to Wootton Basset. Despite good progress I did not make it to the town much before dark and was glad to get a room at the Crown Inn. Later the landlady cooked me egg and chips and I was able to dry my kit and enjoy a good night’s sleep. After a good breakfast my first objective was to bypass Swindon by walking first to Purton and then Cricklade. Stopping at Cricklade I enjoyed some milk and a sandwich and then embarked on a long section of the Thames footpath to Lechlade. This was a long, drawn out affair as the river meandered across miles of pastures and meadows with little interaction with village life until the final two miles of the journey. On arriving at Lechlade I was astonished how late it was- 3.30pm! I still had Burford to encounter and a chunk out of the Chipping Norton section too. Soldiering on with sore feet I made reasonable time to Burford and continued from there along the A361 to Shipton where, at the point of dusk, I camped at the cricket club, courtesy of the ground staff, and retired to the Lamb Inn for supper. It was a rush to decamp in the pouring rain though I was able to shelter my gear under the pavilion until ready to go. The roads were flooded on both sides today making my passage to Chipping Norton a torrid affair. Once in town I stopped for coffee and went to the bank to cash a traveller’s cheque. Continuing out of town a chap pulled up to enquire whether I had seen a young lad wondering the busy road. He would have stuck out like a sore thumb on a day such as this which could only have been savoured by a madman! It was dreadful all day and quite hazardous along the winding wet road. I made it to Banbury by 3pm and was glad of a meal at Wetherspoons. After a hot drink I made my way along the thoroughfare accompanied by an Asian lad who helped me find a better road for the evening walk into Northamptonshire. I was grateful for his help and after parting I used the Overthorpe Road to cross the border. From here I walked to Middleton Cheney where a local lady escorted me across the fields and onto the Thorpe Mandeville Road. With the help of a few more locals I was able to locate the appropriate footpaths across the agriculture to access the village and the idyllic Three Conies Inn. The landlord was very kind allowing me to camp and giving me a nice beef stew to warm me up. I chatted until closing time, drying off the wet kit whilst enjoying good company. We all hoped that one day my Oundle Pilgrimage would extend this far to the boundaries of Northampton where we would endeavour to support our local charities. Setting off after coffee at the inn, I continued my quest along the Helmdon Road stopping for snacks at the grocer store in Sulgrave. It was a slow painful journey as I ticked off the villages en route which included Helmdon, Wappenham and Abthorpe. Stopping at a Macdonald’s by the main road junction, I had a burger and tea before heading into Towcester. Beyond the town I walked a footpath beside the A43 as far as Blisworth where I continued along the old Northampton Road. I had slowed right down by now with a badly swollen ankle and formidable blisters which hurt on every step. By nightfall I had followed the Nene Way out of town to Northampton Casuals Rugby Club who were kind enough to let me camp on their ground and join them in the bar. I had a meal later and retired to a warmer night under canvas. Setting off to the tune of the morning chorus, I now had a fair chance of reaching Oundle today. The journey was not without pain, becoming a laboured affair along cycle routes and river bank as far as Wellingborough. From the Embankment the Nene path saw me clear of towns for a while and beyond Irchester I followed the old Nene Railway track all the way to Thrapston. By the time I entered town I was ‘wasted’- barely moving and caused enough concern for Gordon Marsden (old cricket pal) to pull up and ask if I needed a lift! I explained my predicament and he praised my effort wishing me well for the trip to Oundle. Suffering from exhaustion prompted me to seek food and administer medical aid to my feet which were now throbbing. Amazingly, once on my feet I was like a new man and marched the last 8 miles along the main road in less than 2 hours reaching Oundle before nightfall. What an epic! My ankle was the size of a tennis ball but I still limped to the pub for a meal and a pint! Titles based on the Nene Valley. 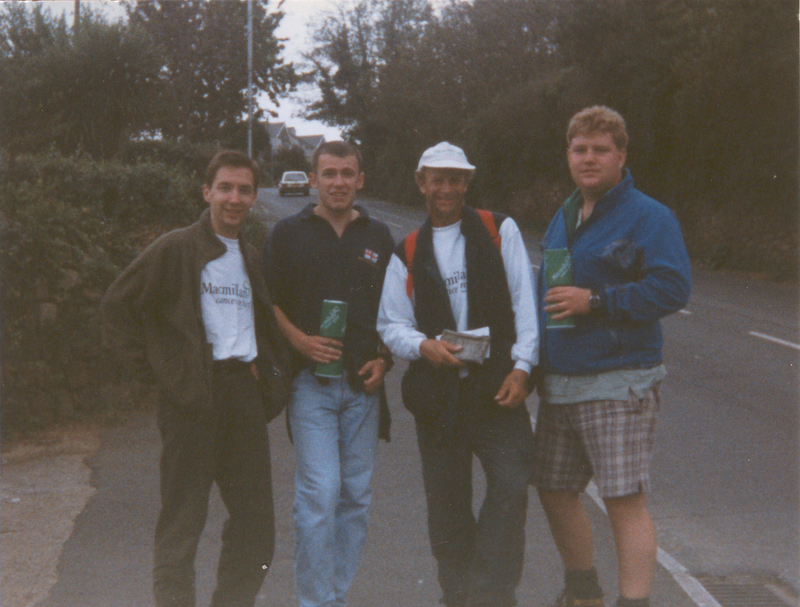 Robin completed his first walk for this charity: then known as Imperial Cancer Research Fund in 1992 when locals at the Ship Inn helped him raise over £500 for the cause. Money was handed over to Adam Baum who was the fundraising executive for the region at that time. Alltogether he has raised over £10,000 locally at Oundle and on national expeditions has helped raise a further £20,000 for the charities. These include: A walk around the Kingdom with Cornwall Radio which helped promote support for cancer research in 1996. Robin distributed over a hundred sponsor forms to places he stayed at en route, and it was estimated that £10,000 was raised in donations made to cancer research shops/establishments. 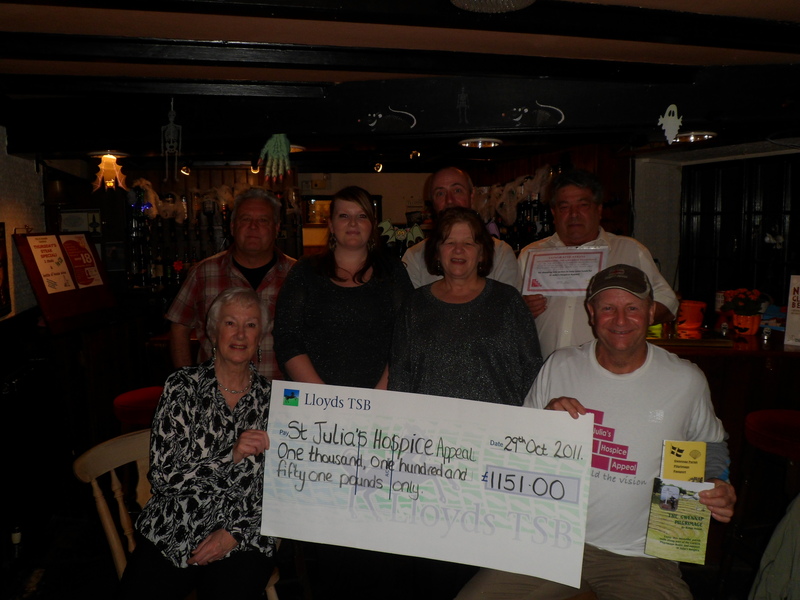 A presentation for locally collected funds was also held at the Ship Inn, Oundle. Four cheque presentations from Robin’s walks were made there between 1992-1996. Robin presented a cheque with Chris York and Billie Wilson to Cancer Research UK. 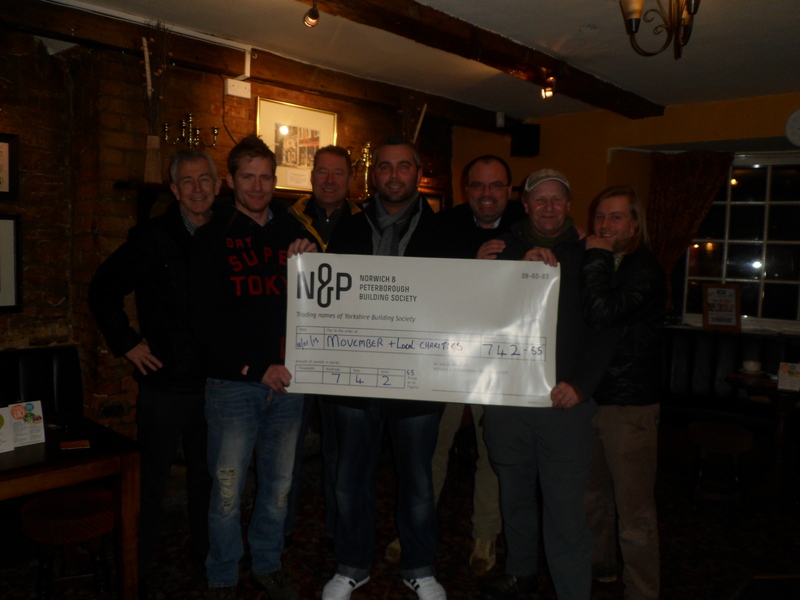 The cheque represents money raised in Oundle for Robin’s Charity walk in South Africa. 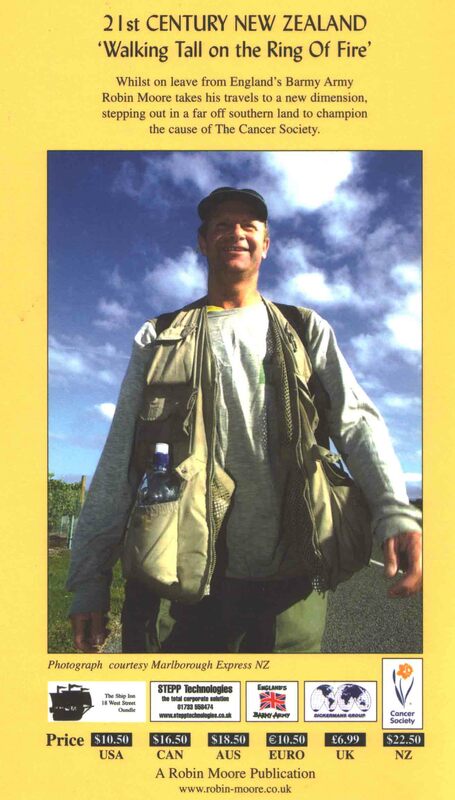 In 2002 Robin was invited to walk for the Cancer Society in New Zealand to help raise their profile and promote fundraising across the country. Whilst off-shore, Janet Sherwood worked tirelessly distributing sponsor forms for Cancer Research UK to organisations/clubs in Northamptonshire in an effort to raise £10,000 for the charity. The charity and Robin owe a great debt of gratitude to Janet for all her kindness and hard work. Some of the organisations who backed the campaign still make annual donations to the charity in respect of Robin’s challenges and efforts of endurance. With the help of John Woodcock, Robin endeavoured to raise £20,000 for the charity. ‘In fact if John had not been involved it was unlikely I would have even started!’ He found me accommodation for each night (125 in all), raised £5000 before I got going and delivered sponsor forms to each venue. Scotland was the most productive place with fundraising events held along the way; Brighouse Bay raised £1000 on the night. In other instances Macmillan representatives turned out to fundraise around their communities often collecting between £50-100. It felt good to know my walk had made a contribution to each region, and hopefully my efforts served as an inspiration to others. The walk around Great Britain took 125 days making it the fastest walk of its kind, averaging 36 miles per day(often carrying one/two packs weighing up to 40lbs. In 1998, Nina Barough invited me to join a group of girl power-marchers (70 plus for the night event) to walk the London Marathon. The event was a huge success raising over £100,000 illustrating the power of the media and fundraising in numbers. Since then, Nina who founded the charity, has become a National fundraising pioneer and well-respected ambassador. 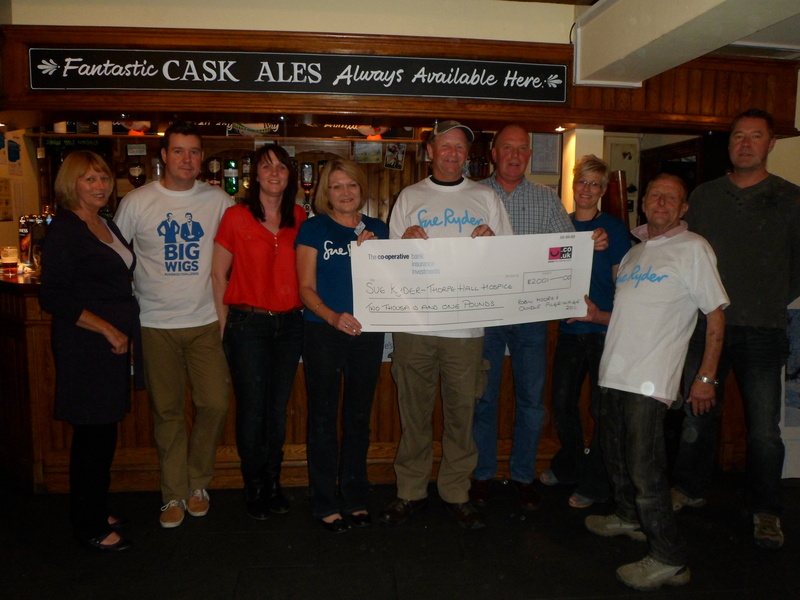 Cheque Presentation at the Fox & Hound’s Comford. Project manager/charity walker Robin Moore and friends hand a cheque over to the executive from Hayle. Robin founded the Cornwall Pilgrimage Project to help raise awareness/funds for hospice care and local charities in Cornwall. St Julia’s Hospice was one of the first charities to benefit from this; the last 2 presentations at the Fox and Hounds Comford have raised over £2000 for St Julia’s. We are presently fundraising at the Coppice Inn where we hope to be walking the Gwennap Section of The Cornish Pilgrimage each of the Spring Bank Holiday Weekends. We hope to have a good attendance at our Gwennap Pilgrimage Walk/fun day (first encounter is Easter 2016). Walking guides/passports are available at Gwennap Pit; The Coppice, Star Inn and St Day Post Office. The Oundle Pilgrimage was founded by Robin in 2010 to support Sue Ryder Care which remains his priority charity in the Nene Valley. Robin thought of the idea when friend and local barman Dean Ingram died of cancer at the age of 28. ‘Thorpe Hall has looked after many of our people from Oundle and its time we put them on the map in Northamptonshire. This annual event is a way of saying thank you to Thorpe Hall and putting something back into a worthwhile cause. Despite the sad circumstances associated with the job, we are all very grateful for the palliative care provided by these wonderful nurses.’ The Pilgrimage has raised nearly £10,000 so far and the spin off events since including ‘The Big Wigs’ challenge won by the Rose & Crown, realised a further £10,000 raised in the 2011 putting Sue Ryder well and truly on the map in the Oundle Region. Thorpe Hall invites you to take on the challenge of Robin Moore’s Oundle Pilgrimage and help to raise much needed funds for Sue Ryder – Thorpe Hall Hospice. Walk or cycle around all or part of a route taking in the beautiful Oundle countryside. The Pilgrimage is the brain child of Robin Moore, a well known local man, who is an endurance walker and has already walked over 25,000 miles for charity in various parts of the world. Any funds raised from the Pilgrimage will go to Thorpe Hall Hospice. The Pilgrimage takes in local inns and churches and Pilgrims can have their ‘passports’ stamped along the way. The walk passes through several villages and refreshments will be available at many of the pubs along the route. Walking guides and passports are available at Trek-kits (01832 272050 or email info@trek-kits.co.uk. There is also a 40 mile cycle route marked out with scallop shells and red/yellow taped sign posts. Visit www.robin-moore.co.uk for more information. Funds raised from the Oundle Pilgrimage 2012 have exceeded last year’s effort thanks to Robin’s walking groups at Fotheringhay and Thurning. 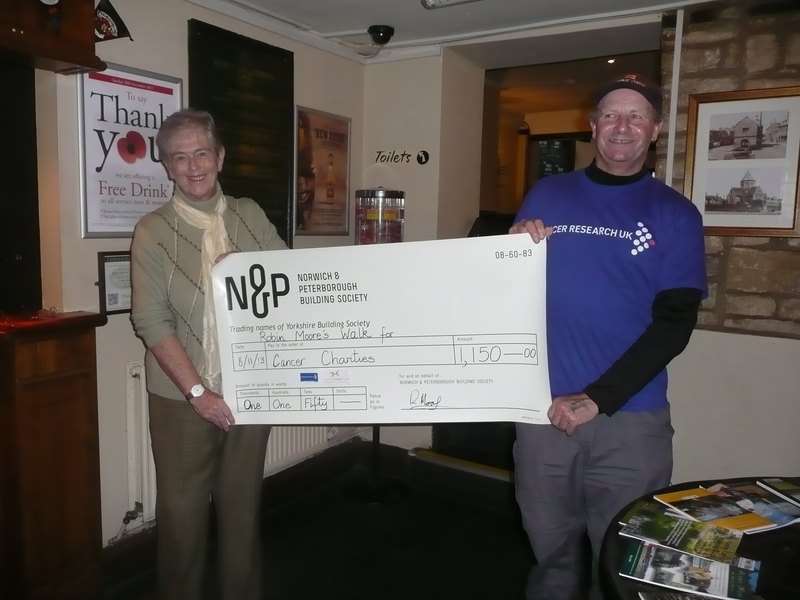 The total amount presently stands at £2040.43; most of which was presented at HQ, Rose & Crown on the 9th November which was also Robin’s launch date for MOVEMBER following his recent walk across Europe. * Sue Ryder – Thorpe Hall Hospice is a 20 bed hospice, which provides specialist care to patients with life limiting illnesses, mainly cancer. 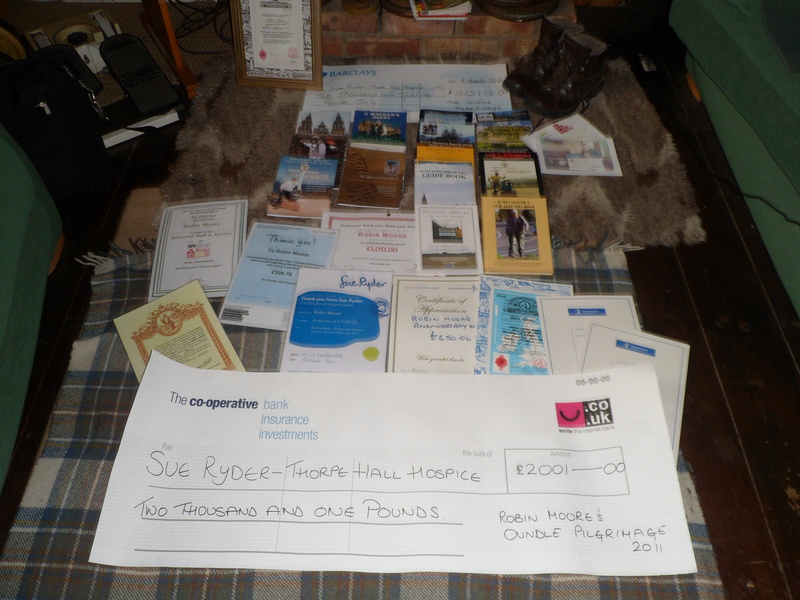 * Sue Ryder – Thorpe Hall Hospice cares for around 500 patients each year. * It costs approximately £300 for a day’s care for one patient at Sue Ryder – Thorpe Hall Hospice. * It costs £2 million per year to run Sue Ryder – Thorpe Hall Hospice; only half of this cost is met by the local health authority and social services. * Most of our patients come from within a 35 mile radius, including Cambridgeshire, Lincolnshire, Rutland and East Northamptonshire, stretching as far South as Huntingdon and as far North as Grantham. * More than 60% of our patients go home after a short stay, normally at around two weeks, though they may return regularly for symptom control or pain relief or to convalesce after chemotherapy. * Sue Ryder – Thorpe Hall Hospice has a day centre, which provides respite, companionship, activities, outings and some clinical care for 60 people each week who have progressive neurological conditions such as Multiple Sclerosis and Parkinson’s disease. Day centre members are not charged for their visits. Robin walked from the Gold Coast to Sydney for the Barmy Army during the last Ashes Test Series, promoting awareness for prostate cancer. The Barmy Army raised over £20,000 on the tour and Robin’s local the Rose & Crown have since raised over a thousand for the charity. It is hoped that Robin will dedicate his next walk in Australia to the charity and as well as representing the Barmy Army, he hopes to instigate fundraising in Melbourne on the next cricket tour. Cricket continues to play its part in helping the charity with many clubs this season hosting charity teas as fundraising events over the summer months. Those interested in participating should contact: Chris Carter: 0208 222 126. A day-to-day diary about Robin’s walk is available on the home page and Autumn news; he hopes to present his sponsorship money for prostate cancer and a few other cheques to local charities at the Rose & Crown on completion of the MOVEMBER Campaign. Walking the length of New Zealand was an ideal way to see the place and market a major charity event during a crucial breakthrough period in research. They were delighted to have me on board to provide good media footage and a platform for fundraising. I had hoped to collect at the test match venues but the cricket sponsors would not allow it. I was permitted to display a banner and still received donations up to around a thousand dollars; just think what we could have done with volunteers with buckets!! Sadly sport is about promotion/sponsorship and as with other countries it is illegal to ask members of the public for donations. I usually have a charity member with me or receive donations via a sponsor form when collecting from the public. In 2008 I continued my travels in New Zealand walking around the North Island to promote the Relay for Life Events taking place along the way. My route covered all the main venues and I was able to give over 20 interviews either on air or via each local media dept. Walking coast-to-coast of South Africa was a tough experience and not very productive due to the lack of enthusiasm from the Head Office who heralded the idea as dangerous. Fortunately I was able to work with Bill van der Linde, the chief executive from the Garden Route and the Blue Whale Patrol offered to keep me company along the way. So between us we made a fist of it. Though not greatly successful in SA, the event at least raised £2,500 for Cancer Research UK derived from support for the walk back home. Since then, Robin has returned to the country and walked the Winelands to help the Cape Cricket Academy and Merwe Genis School of cricket develop youth cricket at the township of Mbekwini. 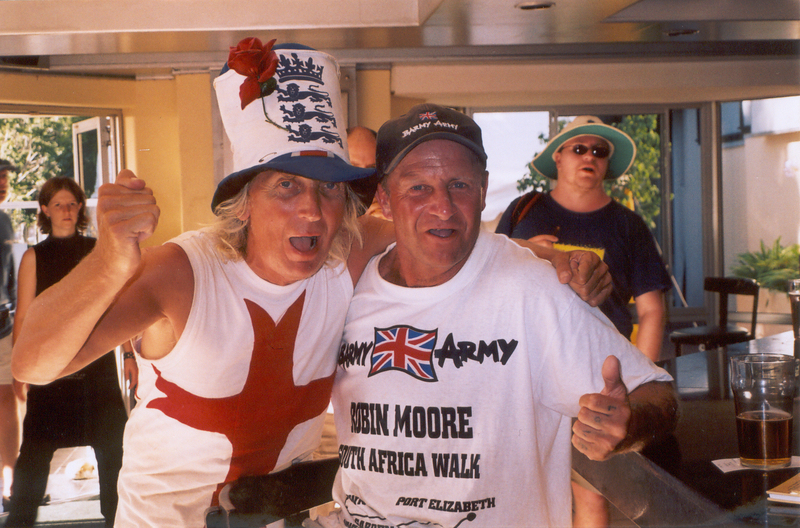 Robin hopes to arrange a Barmy Army cricket match at Boland Park on their next visit to South Africa and may yet participate in another walk to promote the good work of the Cape Accademy. This is the Barmy Army’s leading charity abroad and they were successful in raising over £23,000 during the Ashes campaign 2011. 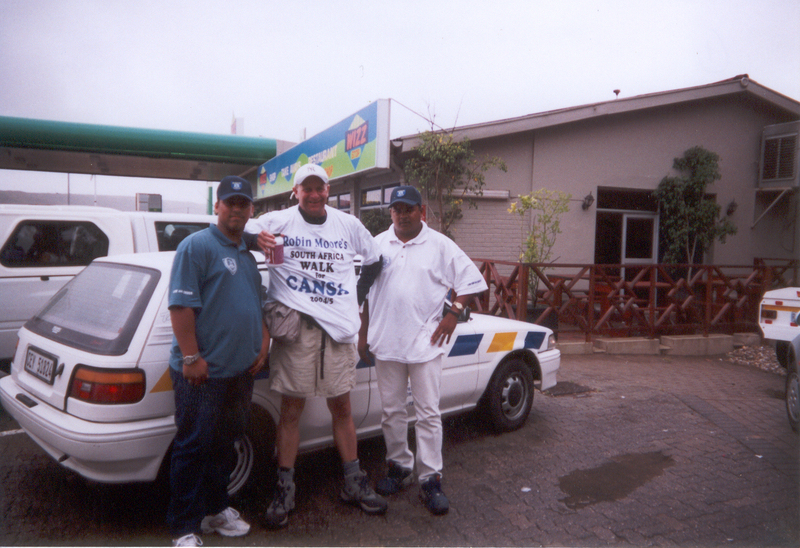 My role was to spread the word through media during the latter stages of my east coast walk. I was also supposed to deliver a cricket bat at the SCG; sadly this was stolen whilst I was chatting in a chemist on the outskirts of Ballina!! Any one wishing to support Robin’s walks are invitied to do so at the appropriate online justgiving pages.